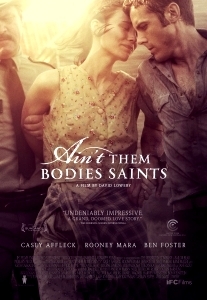 In UK cinemas this week having made a splash at both Sundance and Cannes, David Lowery’s romantic crime yarn Ain’t Them Bodies Saints (2013) is pretty much deserving of the all accolades bestowed upon it. It’s a familiarly-told tale, captured in a perpetual magic-hour haze, with a genuine feeling of passion and longing running throughout. Beginning the tale with what looks like a Bonnie and Clyde-style denouement, outlaw Bob Muldoon (Casey Affleck) is involved in a siege with lover Ruth Guthrie (Rooney Mara). Ruth accidentally shoots a police officer for which Bob takes the heat, earning himself a prison sentence. Several years later, a still-incarcerated Bob is desperate to be with his lover and young daughter. Escaping from prison, the fugitive begins making plans to reunite with his family, but there may be more obstacles in the way than he initially anticipated. Packing a lot into the first ten minutes, Ain’t Them Bodies Saints soon settles into a (purposely) languid affair, with a stillness and pensive atmosphere which serves the story beautifully. The Southern landscape has a timeless quality, and although the film’s 1970s setting is made clear, it could almost be from several decades earlier. Lowery borrows from his 70s cinematic heroes Altman and Malick, and this is also inherent in his choosing of character over plot. If the role isn’t much of a stretch for Affleck, (he exhibits that same steely-eyed resolve as seen in The Assassination of Jesse James and The Killer Inside Me) he proves once again what a fine actor he is, while Mara continues to channel that chameleon-like acting persona. As solid as the leads are, it’s the ever-dependable Ben Foster who threatens to steal the film from under them. Cast as the town’s kindly police officer Patrick Wheeler, he positions himself as a potential suitor for Ruth, the women who almost killed him. Wheeler’s speech to her towards the end of the film is as heart-felt and moving as they come, and it showcases a sweeter side to the actor, who is often renowned for playing disturbed, wiry types. Further bolstered by a haunting, yet melodic score, Lowery’s Ain’t Them Bodies Saints is an elegant and poignant affair. If the separation of the couple early-on leaves little in the way of meaty back-story for audiences to fully invest in, there’s little doubt as to their huger and yearning for each other as the story progresses.